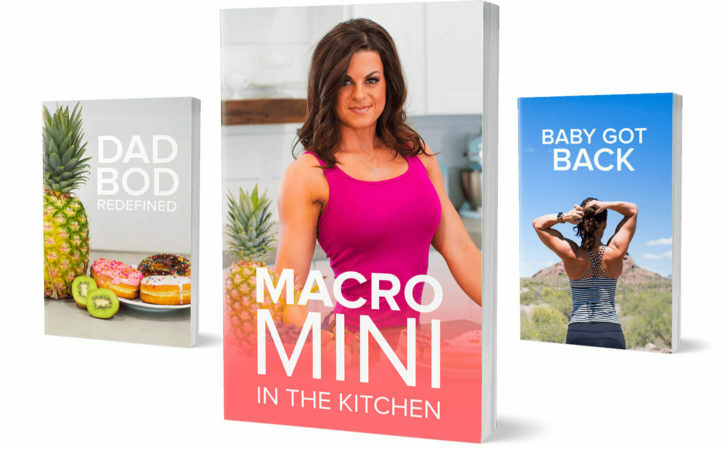 My programs are 100% created for you and only you…there is no one size fits all plan with Macro Mini. If you are looking to establish a fun and healthy lifestyle, then START TODAY! It’s time you begin your journey to becoming the best version of you! Macro Mini Programs are now at your fingertips. The Macro Mini Application can be accessed via the phone or computer once you sign-up for your 12 week plan. 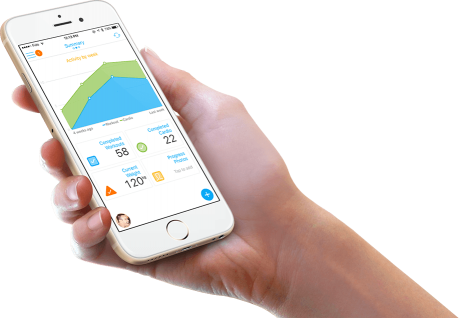 My Programs allow you to view your workouts, nutrition plans, track measurements, upload pictures and easily access me, all from your phone. The Macro Mini Programs are customized to your individual needs, experience and nutritional preferences. No crash diets or cookie cutter plans! I am about creating a fun, healthy and balanced lifestyle. Went to the pool for the first time this summer and felt like a million bucks. I put my sunscreen on and couldn’t actually believe that my abs were mine! It was a great feeling to not feel self-conscience but instead I felt very confident for the first time ever at the pool! I’m looking forward to measurements this next week to see how far I’ve come. I’m looking forward to our vacations coming up this fall and feeling good about being in a swimsuit and playing in the water with my kids. I still have a way to go to get to where I want to go but I know every day I’m getting closer and closer and the baby steps are paying off, all while feeding another little person too! I have been able to wear shorts and summer clothes that I haven’t worn in a while because they just didn’t fit right either. Now I don’t have to think about it. The number on the scale too was a great thing to wake up to too. I haven’t been able to break 150 since before having kids 6 years ago! I owe that to you for helping me get there. This is only the beginning too! These 3 months have honestly changed my life with you! Not only physically but mentally. You are super patient and kind, and you always helped me out no matter how complicated I was! You taught me so much about flexible dieting and furthered my knowledge into macronutrients. You are awesome and you were super encouraging the entire time and honestly this was like a jumpstart back into fitness for me seriously and truly. I always doubted myself and haven’t been very motivated lately but sending you pictures and you holding me accountable really helped me to want to better myself. Thanks for everything! 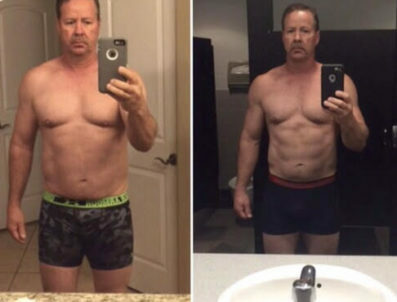 I never really had a coach that cares about me: how I feel and about my progress… Most online-coaches that I’ve met before just made a meal and/or workout plan that was not customized. They would give it you me and that was it. I’m so blessed to have found Macro Mini, someone who really cares about me! I really want to thank Megan! You are an incredible person, it’s so nice to have you as coach. Thanks for everything! Working with Megan has hands down been the best decision I have made. Not only is she professional and educated, but she is also encouraging, respectful and always available when I needed her for questions/ concerns. I have completed 12 weeks with Megan so far, and I have decided to extend for another 12 weeks with her. This was not a hard decision for me, since I have worked with numerous trainers in the past that never seemed to have my best interest at heart. Megan has taught me how to eat foods that still taste incredible, but give me the results I am seeking, all while staying healthy and feeding my body what it really needs to fuel it. 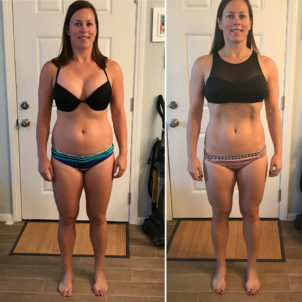 In addition to all of this, she has been flexible with me, which is a tough task for any other trainer I have worked with before due to being a full-time dual degree nursing student, who also works – but this has never been an issue with Megan. She has been nothing but accommodating for me to help me reach my goals. She is thorough and easy to work with, and has made ‘dieting’ something I actually enjoy doing. I have a smaller frame, and have always been athletic. With Megan’s help I came down about 10 pounds and almost 10 inches overall. 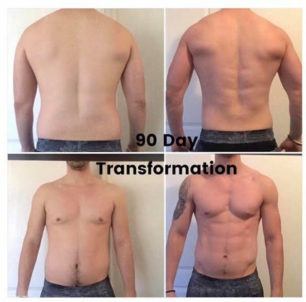 Megan has taught me that this is a lifestyle, it IS possible to eat great tasting food, not spend hours and hours in the gym and STILL get killer results. I can’t wait to see where the next 12 weeks take me!! Professional, Knowledgeable, Walks the Talk! If this is a Nutritionist you are looking for then Megan is your Professional! My nutrition and lifestyle program has been very helpful in making me aware and accountable for eating healthy foods and exercise daily. I highly recommend Megan as your Nutrition Coach! I’ve had the pleasure of working with Megan twice in the last year and a half. The first time I came to her, my metabolism was shot from competing twice the year before. My hormones had grinded to a near halt and I was pretty sure adrenal fatigue was happening, too. Somehow, I had gained weight as well and I desperately wanted to lean out again for my wedding. Megan took the time to do a full review of the current plan I was on and formulated a plan to help me recover. Her meal plan consisted of very tasty items that were full of flavor and included some fun flexible foods as well which made it easy to follow. The workouts were challenging but also interesting so they kept me engaged throughout the process. 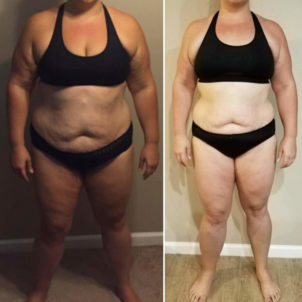 I know everyone wants to hear about fat loss and I did successfully drop quite a few pounds in the first few weeks of working with her and looked amazing! However, I cannot emphasize how much better I felt! My moods improved significantly and I started to understand just how out of balance my hormones had been before seeking out Megan’s guidance. 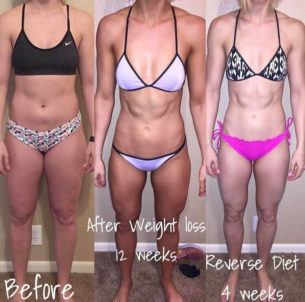 She truly has the knowledge to understand how my body is responding to a program and adjusts the nutrition plan and workouts accordingly to get results. In addition, whenever I had questions or concerns, Megan has always been incredibly prompt in her responses which I appreciate. Currently, Megan has helped me move into a Ketogenic Diet which helps keep my nerve pain at bay. Once again, the menus are fantastic, my body has started to respond beautifully and I’m feeling better every day! I’m so thankful I found Megan as a coach and have recommended her to many of my friends and family. Given her medical background and experience as a competitor, in my opinion, you could not find a better coach out there than Megan! I just have to say at almost 46 years of age I am finally starting to feel comfortable with my body. 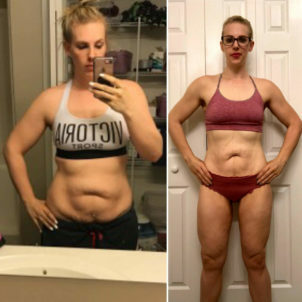 After trying every single fad diet, binge eating ,gaining weight with my pregnancies, then doing a fitness show and gaining extra weight back I finally found a coach that has helped me live again. I no longer weigh myself every day, I have food choices, I enjoy vacations and my family again. And I have NOT binged! Don’t get me wrong I’m still totally insane about food and working out and trying to maintain but at this point my life with my hormones changing and body changing I’m so grateful to have Megan in my corner! She reassures me constantly and helps me to keep and maintain my fitness goals, Megan is not only an amazing macros coach but she also is a nurse practitioner which I find very comforting since I am a registered nurse. Megan has tons of experience and knowledge and she is more than willing to educate and find what fits and works for you! And if you’re like me you need tons of reassurance. Getting older is not easy and having a coach who actually listens and takes the time to help make the world a difference! She sure is my fitness queen! My name is Ken Barnes and I’m 54 years old. I decided around March of this year that I would compete in the World Police/Fire Games; in LA competing in the CrossFit competition. I was working with a coach who informed me that nutrition would be 70% of working toward success. He wanted me to completely overhaul my nutrition plan. Through a friend I was introduced to Megan of The Macro Mini. We communicated through email, this was fast and very easy. Megan was a pleasure to work with from the beginning, we started together April 3rd. The questionnaire form was very simple to fill out as well as the 3 day meal sheet. She returned a meal plan to me within a few days and off we went. I did have several questions from the beginning that were answered in a very timely manner. I won&#39;t lie, the first week was a tuff adjustment but once my body became use to the new foods I was consuming I really started to feel better rather quickly. I do really enjoy all the meals I’ve been eating as well as the snacks. Sometimes I feel like I’m cheating with some of the things I’m eating. The pounds really feel off fast. I had a goal of losing 20-25 pounds by August 12th when the competition begins. Its mid-June and I’m down 23 lbs and feel great. My workouts are improving daily and I’m ahead of schedule. Oh, I forgot to mention that I had shoulder surgery in early March and was told not to plan on making the Games. Today, 6/16/2017, I was able to perform a few muscle ups, something that was supposed to be a far reach to obtain. I’m now running at the head of the pack when running is in our workouts also. I have done so well my Wife and Daughter have now started working with Megan as well as 5 of my friends. What Megan has done for me in such a short time is amazing. If you are dedicated and discipline you will succeed on Megan’s program. I have 8 weeks left before the competition and believe Megan will have me in the best shape of my life. Wish me well. I love Megan! This program has been amazing for me. I have a really crazy schedule right now and Megan has been able to work around that and get me a plan that works for me. I love the Macros. I am able to eat what I want and what I like. I love the flexibility of being able to fit different things into my meals. Most days I don’t even feel like I’m on a diet or restricted. Macros and Megan are seriously amazing! FOR UPDATES ON NEW PLANS, PACKAGES, AND MORE!